Spring is just around the corner, which means more people will be planting trees. Planting a tree is a wonderful way to improve the environment, increase property value and enhance the appearance of a neighborhood. But, if you don’t follow the proper planting techniques, your good efforts can quickly have more disadvantages than advantages. Proper tree planting is something that we should all be familiar with, as it’s the foundation for a healthy tree and a long life. 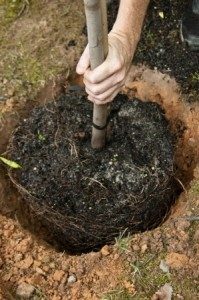 The best time to plant a tree is in the early spring or fall when the roots have time to establish themselves during the heavy root growth seasons. Plus, the added rain in the spring and fall is helpful in getting the roots to establish themselves in a healthy manner. Since spring is almost here, the tree planting season is, too. Here are some important tips to keep in mind when planting a tree. Dig a shallow, broad hole that is about two times the diameter of the root ball. The top of the root ball after planting should be a little higher (a couple of inches) than the surrounding grade. The hole needs to be wide so that the roots can push through the surrounding soil and secure themselves. Keep in mind that in new developments, the soil is often compact and not ideal for healthy root growth. This type of soil will need to be expanded and loosened to serve as good growing soil. Leave a pedestal of undisturbed dirt in the middle of the hole for the rootball to be placed on. This will help with water drainage and avoid settling. If the hole was accidentally dug too deep, place a large rock or some bricks in the middle of the hole to form the pedestal. The trunk flare is where the roots spread out, and it should be visible when the tree has been planted. By identifying the trunk flare, you can determine how deep the hole needs to be for proper planting. If the flare is not partially visible, you may have to remove some soil from the top of the root ball. If the tree you purchased came in a container, you will need to remove it before planting. Try cutting down the container around the sides and inspect the root ball. This will give you the opportunity to expose the trunk flare and cut and remove circling roots. Set the tree in the hole on the pedestal. Straighten the tree, and look at it from different angles to make sure that it’s standing straight from all four sides. When filling the hole, you want to do so gently but firmly. Fill the hole about ⅓ of the way, packing the soil around the base of the root ball. Add some water and temp down to remove air pockets and secure the tree. When everything is intact and all fabric, plastic, metal baskets, and string has been removed, fill the rest of the hole with soil, adding water and tamping down as you go. Do not apply fertilizer to a newly planted tree. Not all trees need to be staked, but if yours does, do it now. Staking is used to help the tree stay upright. However, as long the tree is planted appropriately, most trees don’t need to be staked. Staking is best reserved for thick canopied trees such as evergreens or where windy conditions are present. If it must be staked, protect the trunk by placing hose around metal cables. The tree should be able to move with the wind to allow for the development of good trunk taper. All staking material should be removed by the end of the first year. Now it’s time to mulch the base of the tree. The purpose of mulch is to hold moisture, provide nutrients to the tree and keep grass and weed growth at bay. Wood chips make a good much because they break down slowly and don’t glaze over like double shredded mulch does. Apply two to three inches of mulch for the best growing conditions. Trees are living entities, and they require regular care and maintenance to ensure optimal growth. The soil should be kept moist, branches should be pruned and new mulch should be added from time to time. Once the tree is mature it won’t require as much attention, but you still want to ensure that the tree is growing healthily so that it does not become susceptible to disease, injury or infestation.